The Department of Urban Planning and Design (DUPAD) was established in the Faculty of Architecture following the reorganization of the Centre of Urban Planning and Environmental Management (CUPEM) on 1 July 2008 to continue the teaching of urban planning and related areas in housing management and transport which can be dated back to 1980. The Centre of Urban Studies and Urban Planning (CUSUP), which was established 28 years ago in 1980 and renamed as CUPEM in 1991, was re-established to continue interdisciplinary research in urban studies and planning. DUPAD offers taught post-graduate and MPhil and PhD programs in Urban Planning, Urban Design, Housing Management and Transport Policy and Planning. The MSc (Urban Planning) program is professionally recognized by the Hong Kong Institute of Planners (HKIP) and Royal Town Planning Institute (RTPI) and the Chartered Institute of Logistics and Transport (CILT) International for students in the transport stream. The professional stream of the Master of Housing Management (MHousMan (Professional Stream)) program (jointly offered with the School of Professional and Continuing Education (SPACE)) is recognized by the Chartered Institute of Housing (CIH) and Hong Kong Institute of Housing (HKIH). The MA in Transport Policy and Planning (MATPP) (jointly offered with the Department of Geography and Department of Civil Engineering) is recognized by the Chartered Institute of Logistics and Transport (CILT) International. The Master of Urban Design (MUD) is a professionally oriented program for urban designers. The vision of Department of Urban Planning and Design, together with its research arm Centre of Urban Planning and Design, is to become an internationally leading planning school with excellence in teaching and research in urban studies, aiming to help reshape urban planning and policy in Hong Kong, China, the Belt and Road Region and elsewhere with its world-class urban science and policy analytics. To develop the Department as a collegial unit to prepare researchers, teachers and students to extend their knowledge and expertise to serve the wider community. Staff members of DUPAD are active researchers on prevailing issues related to urban and regional development in the global, regional and local contexts. The main research focus is on temporal and spatial issues of sustainable development in Hong Kong and the Pearl River Delta region. The basic objective of the Department’s research program is to enhance and extend our knowledge and understanding of sustainable development issues in high-rise and high-density cities such as Hong Kong and other cities in China and Asia. Research findings are published internationally and locally to facilitate intellectual and professional debates and policymaking. DUPAD also hosts the Centre of Urban Studies and Urban Planning (CUSUP), which facilitates inter-disciplinary research in urban studies and planning. 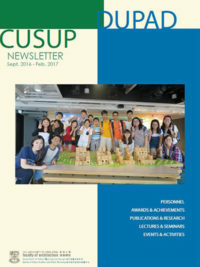 The main function of CUSUP is to foster interdisciplinary research in urban studies and planning in the University of Hong Kong. It aims to act as a focus for interdisciplinary research and to offer a forum for academics, practitioners and the community to exchange views on urban studies and urban planning; to undertake contract research for both the public and private sector; to organize seminars, conferences, and workshops; to publish working papers and monographs; and to promote inter-institutional, regional and international cooperation in urban studies and urban planning. 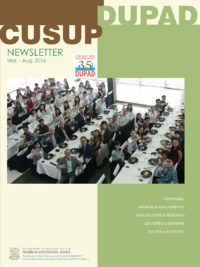 CUSUP periodically organizes conferences, workshops and seminars, and publishes monographs and conference proceedings. It is also the home base for the Asia Planning Schools Association, the Asia Pacific Network for Housing Research and the Hong Kong Housing Research Network. The Department also conducts contract research projects for the public and private sectors in Hong Kong, and for international agencies. It has various academic exchange programs with universities in China, Australia and UK. The staff of DUPAD serves on a wide range of government boards and committees related to urban planning and design, urban redevelopment, housing, and transport. They are also actively involved in the activities of professional institutes and the private sector in the urban and property field.